Officials propose a permit system for accessing Kanarraville Canyon, now drawing more than 40,000 yearly visitors to slots and waterfalls that also supply water to a nearby town. 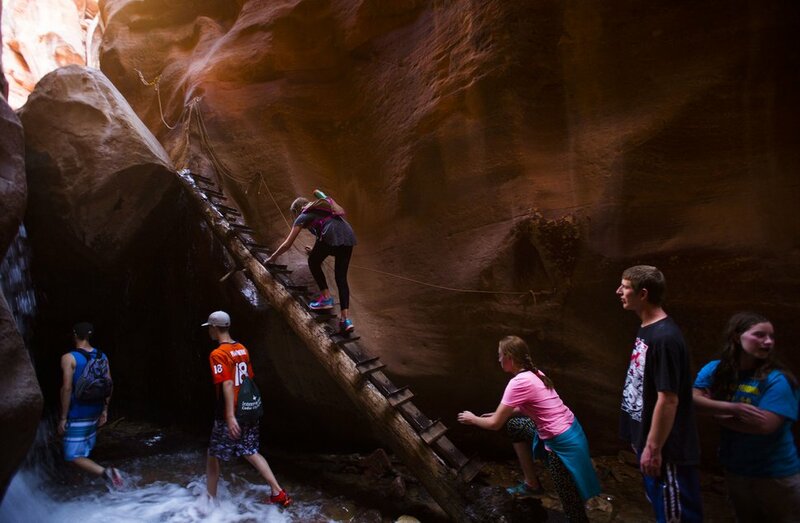 (Brian Maffly | Tribune file photo) Kanarraville Canyon in Iron County has quickly become one of Utah’s busiest hiking destinations, posing huge problems for the town of Kanarraville, which draws its water supply from the narrow canyon. Local officials are looking for ways to limit the site's use, but the land is public. 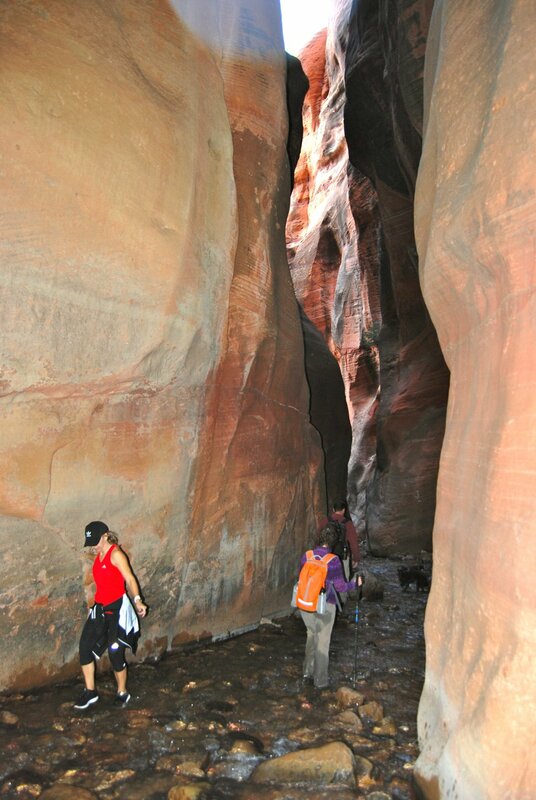 Kanarraville • Visitors to a popular southern Utah hiking destination may soon require a permit and have to pay a fee under a plan Iron County is developing to address overuse in Kanarraville Canyon. Thanks to the site’s easy access off Interstate 15 and social media chatter that has boosted its popularity, several hundreds of people a day hike through the stunning slot canyon to a series of waterfalls on state trust land. Officials of Kanarraville, a tiny hamlet that pipes its drinking water from a well in the canyon, say the time has come to restrict that access, but they lack the resources and authority to enforce limits even as visitation skyrockets. So Iron County has stepped in, offering a potential solution that entails leasing a pivotal state trust section of land in the canyon, giving county officials the right to block passage. The idea is to require visitors to obtain a county permit and pay a per-head charge, according to Mike Worthen, the county’s public lands director. No limits would be imposed right away, Worthen said, but dogs could be prohibited. “It will be a pilot this year, just putting a fee in place and see if that will curtail traffic to a manageable level,” he said. Next week, the Iron County Commission will consider temporarily closing the mile-long road from town to the well where the canyon narrows. For years, it has been popular place to ride ATVs in that locale, but officials fear the road is too crowded to accommodate both pedestrians and motorists. The foot trail continues past the well through a slot and ascends two waterfalls via ladders. On Friday evening, Worthen and other officials will present details on the proposed permit system at a town meeting. Not all residents agree that limiting access to public land literally in their backyard is a good idea, but officials insist something must be done to preserve the canyon. “The experience is ruined if there are 1,000 people in there. You have to wait an hour to climb the ladders. It’s a huge public safety issue” during the late summer when monsoonal rains trigger flash floods, said Dave Jacobsen, a recreation planner with the Bureau of Land Management. The federal agency acquired 40 private acres at the canyon mouth last year to better manage recreational use. “I think hiking in the canyon is a great thing, but there needs to be a balance,” said Todd Lloyd, a Cedar City resident who farms in Kanarraville and holds a senior water right in the canyon. He is concerned that silt loosened by visitors trampling the creek and its banks clogs the filters on his irrigation system. Steve Griffin / The Salt Lake Tribune Hikers climb a ladder made from a tree at the first falls of the Kanarraville Falls hike in Kanarraville Wednesday July 6, 2016. In recent years, the town has built and operated a parking area at the trailhead, where visitors deposit $10 per vehicle in a box. Nearly one-third of the town’s annual $250,000 budget is covered by this revenue. Now 43, Allred spent his boyhood exploring the canyon with friends toting .22-caliber rifles; they hardly ever saw another person. That solitude vanished after 2003, when visitors began posting pictures of the slot canyon on the web. With less than a mile’s hike to the narrows, the canyon has become a must-see spot, especially for families crowded out of nearby Zion National Park. The BLM has used remote counters to estimate use at 40,000 a year, but Allred suspects it’s closer to 60,000. “People are looking for that canyon experience and Kanarraville offers that with easy access,” Iron County tourism director Maria Twitchell said. 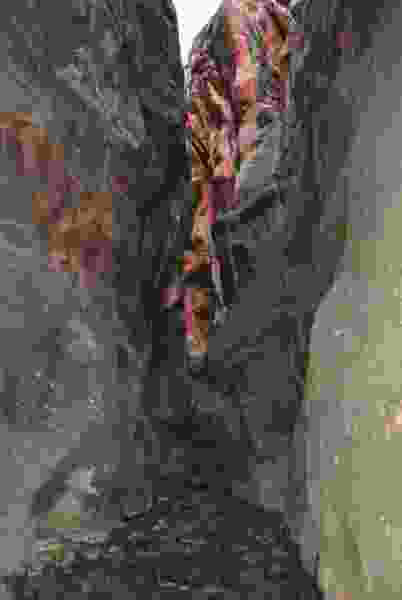 Many hikers venture into the canyon ill-prepared or not physically agile enough to safely navigate the steep stream banks and climbs. Rescues are common, further burdening local authorities. Three times last year, a medical helicopter landed on Allred’s property near the canyon mouth, designated as a staging area for emergency evacuations. In one instance, a man had suffered a broken neck after falling from one of the ladders. In another, a helicopter was dispatched into the canyon where a man had fallen while climbing the sidewalls between the two falls. He had to be carried to a ledge and hoisted to to safety. Allred said he has personally carried out seven or eight less seriously injured hikers. He has lost exact count.